Although the halftime show at the 2012 Bridgestone Super Bowl lasted only 12 minutes, months of planning and testing by Nashville production company DWP Live went into the spectacle. Set designer Bruce Rodgers of Tribe engaged Orlando based LMG, a video, audio and lighting technology provider, to develop lightweight LED for the main stage. In turn, LMG partnered with Danny Whetstone’s DWP Live, for field projection in front of the stage. In preparation for the Super Bowl, DWP Live staffers traveled to LMG’s headquarters in December 2011 to test eight crane rigs, which were each used to hold a bundle of four projectors in the air, shooting downwards 150 feet onto the field surface. A total of 32 Barco FLM HD20 projectors were used to cover the 11,000 square foot projection area. Actual setup time for the halftime show happened in a strict 12 minute time frame. 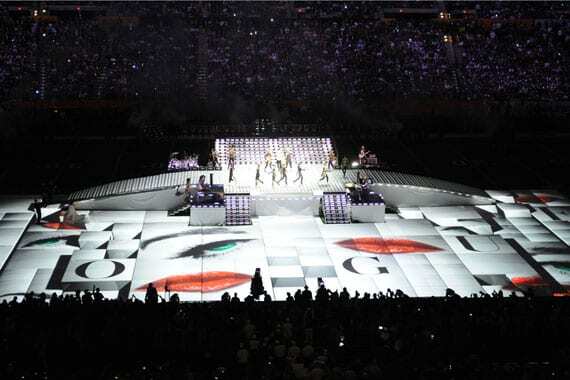 The LED team and over 500 volunteers rolled out and assembled the stage on the field, comprised of 796 lightweight FLED tiles, constructed into fourteen customized LED carts. The result turned the stage and field projection area into everything from Vogue magazine covers to reverberating speakers. More than 114 million Americans watched as Madonna performed songs with guests LMFAO, Cee Lo Green, M.I.A. and Nicki Minaj, around the displays. After the performance, breakdown and removal of the stage and projection area from the field was completed in less than seven minutes. DWP Live was founded in 2007 as a single source solution for production services, AV design, and equipment rental. Since the company’s founding, it has experienced rapid growth and become a key partner for trade shows, corporate events, concerts and permanent facilities around the world.